SprayMax - The Aerosol System that sprays as well as a gun! 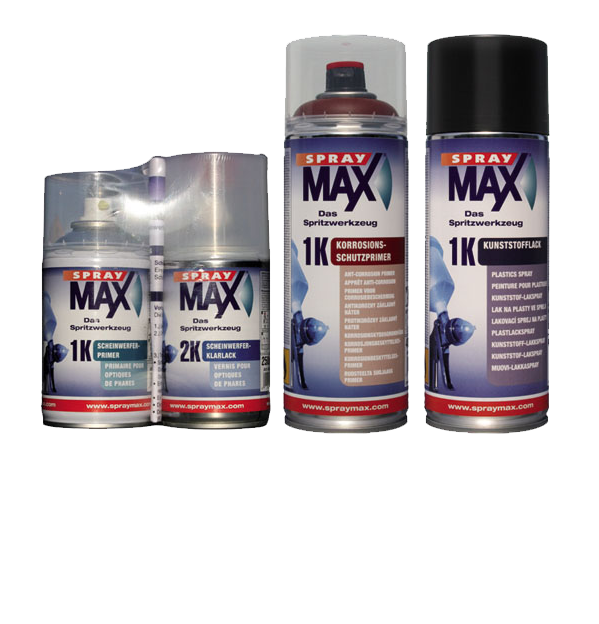 SprayMax is a complete, balanced spray paint can assortment for fast, effective and economical paint repairs of all types. The application areas are, among other, motor vehicles, commercial vehicles, boats and marine. The entire painting process, from cleaning, priming, base and topcoat, clear coating up to touch ups can be completely carried out using the SprayMax. SprayMax profits from its unlimited mobility and sets itself apart from conventional repair paints that are spatially ties to a spraying booth and supply lines. That lets SprayMax create completely new fields of application - far from any spraying booth. The SprayMax spray paint can technology, manufactured by Kwasny, unifies several patented innovations and represents the state-of-the-art of what's currently feasible in spray paint technology. With this revolutionary technology, you can achieve excellent painting results, which was only possible with a spray gun up to now. For more information about the SprayMax paint repair system click the button below to download the print friendly PDF brochure, or if you would like to receive a quote for this system, please click the request a quote button.